Written by tevensso on March 5, 2011 to Roxette. Source: Microsoft. 13. How Do You Do! Written by tevensso on March 4, 2011 to Live and Roxette. SAMARA - Yesterday's concert in Samara, Russia was a smash, according to Per Gessle. "The gig was super tonite! We cut 'Silver Blue' and 'Watercolours in the Rain' because the concert needed some momentum," says Per when talking to The Daily Roxette. Next stop is the Palace of Sports (capacity 5,000) in Yekaterinburg, Russia tomorrow Saturday. Get tickets here, there are merely 150 standing left. More great photos from Andyash here. Written by Lars-Erik_Olson on March 3, 2011 to Live and Roxette. SAMARA, RUSSIA - Roxette, after opening the Charm School tour in Kazan, has travelled 181 miles (291 km) south to Samara and will perform at the CSK-VVS Sport Palace this evening. The arena has a capacity of 3,800. 193 tickets were still available at 11.00 CET. Roxette café contributed to this article. Written by Lars-Erik_Olson on March 2, 2011 to Live and Roxette. Source: Expressen | Aftonbladet. KAZAN, RUSSIA - Reporters from the Swedish newspapers covering the premiere concert of the Charm School tour have both published stories quoting Per as saying that if all goes well, Roxette will include North America and Australia when the tour is extended this fall. Jens Peterson of Aftonbladet wrote that Per said "We would really like to go to Australia, we would really like to do Canada and the United States and as much as possible. There are plans and sketches. We have said that this is a tour without end right now. Everything is subject to how it works for Marie. We are not like a normal band. She must think it's fun and stay motivated." And Expressen's Anders Dahlbom has Per saying "It's no secret that we want to play in North America and Australia. We say that this tour doesn't have an end." Written by Lars-Erik_Olson on February 28, 2011 to Live and Roxette. KAZAN, RUSSIA (Updated) - It was a shaky at the beginning, with Per and Marie encountering audio problems during the first three songs… but Roxette mangaged to get through that and, according to reports from various fans amongst the approximately 7,000 in attendance, the rest of the concert went very well. The audience seemed to be very reserved at the beginning. Also, because not many people speak English in the province, most people could hardly understand what was said. No welcoming applause to "Hello from Hollywood", though by the first chords of "It Must Have Been Love" the arena exploded with applause and noise. But the guys were great! Really! They did their job and worked and enjoyed what they were doing, and it was like a fire for butter. Slowly, slowly the audience started to make noise, applaud loudly, shout and show signs of appreciation. Roxette didn't ask the crowd to raise their hands (nothing like "raise your hands in the air" or this kind of cheap stuff), they inspired people, and after a few songs people started to move, dance, clap hands, behave somehow to show that they liked what they were seeing. The arena where the show took place is the biggest in Kazan, and it was full… but mostly the seats. There was a lot of space on the dance floor and between the rows, so in the beginning it looked more like a symphony concert. I suppose it's a display of the Russian character: we start slowly, we need time to pick up speed, but once we get going we can hardly stop. By the end of the show, people jumped close to the stage and danced in the gangways! The band was great, they are professionals in the best meaning of the word. To start in a cold atmosphere without showing any disappointment, it costs a lot. They felt some disappointment I suppose, I could feel it by the behavior of Marie most of all, she was quite reserved too, but she was good… really good. Smiling, the voice was beautiful as always, and Per inspired everybody by the music and he did it very well. It was a good mix of new and old songs, and we accepted everything, waiting for their old hits of course. They did win over the audience and the cold Russian winter! They made the snow melt, and spring has finally arrived to our place! Fridapeeples and Roxtexanet contributed to this article. Written by tevensso on February 28, 2011 to Exclusive, Live and Roxette. 14. How Do You Do! Second Encore (Extra extras), and Marie is now wearing the official sweater of Kazan hockey club Ak Bars. Roxette’s Charm School World Tour is underway... with extension planned! Written by Lars-Erik_Olson on February 28, 2011 to Exclusive, Live and Roxette. Fans have been hopeful in recent years that with Marie's recovery from brain cancer, that Per and Marie would reactivate Roxette: take the stage again… perhaps tour… and if all that wasn't possible, at least get into a recording studio and release new material. We've known for months now that all of these wishes are coming true, and today marks another milestone in the duo's career with Roxette. Per, Marie, and the band – along with a very small entourage – boarded what Per has dubbed the "Roxjet" late yesterday morning and flew to Kazan, Russia where, tonight, the first in a long series of concerts will take place in the large basketball arena there. 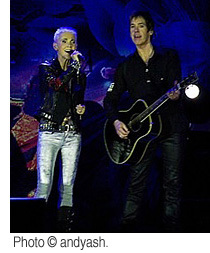 After a handful of successful concerts that Roxette performed this past summer (the results of which are an impressive addition to the deluxe edition of their new Charm School album), they've now set out on a full-fledged world tour that is expected to span at least five continents during the year (see below). By all accounts, both Per and Marie are returning to the world stage full of renewed enthusiasm. While Roxette toured the U.S. in 2000 (Greatest Hits) and Europe in 2001 (Room Service), their last real world tour took place in 1994-95 in conjunction with the “Crash! Boom! Bang!” album. MORE GOOD NEWS TO COME! Additional concert dates, beyond those that are confirmed and appear on our concert calendar, are expected… both within the current time frame, and beyond it. Per, in an interview with German radio station NDR 2 for which readers of TDR were invited to submit questions, revealed that plans are underway to extend the tour into the fall with about 25 more shows. While he mentioned that some would be in Germany, it is expected that other dates will include stops in some of the countries that seem to be obvious omissions from the tour including, perhaps, a North American segment. There has been speculation that that is why the Mexico City date was replaced with Montevideo, Uruguay. TDR's reporter in Kazan, Svetlana Kulalaeva, has let us know that it should be possible to view the scheduled press conference over the internet (link below), and that the Mayor of Kazan (who by some accounts is a Roxette fan himself) is expected to officially welcome Per and Marie. Additional reporting by Michi1506 in Germany. 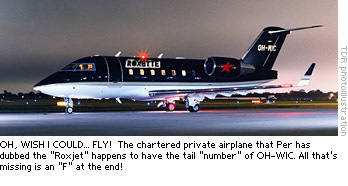 The photo of the Roxjet is an artist's rendition of the actual plane (which LiveNation has leased from a company in Finland — thus the "OH"), with the addition of a Roxette livery. Tivoli warns - do not buy fake tickets! Written by GT_85 on February 26, 2011 to Live and Roxette. Source: HD.se. COPENHAGEN - Tivoli in Copenhagen, Denmark is putting out a warning about fake Roxette tickets. Many sites, among them the infamous Biljett.nu, are apparently selling tickets to the Roxette concert on Friday, July 22, but the concert is free! So again, do not purchase tickets for the Tivoli show, as the performance is included in the price of admission to the historic amusement park. This entrance fee is 95 Danish kroner (about $17.50 USD or €12.75 EUR) before 8 pm. Written by DanJKroll on February 26, 2011 to Music Business and Roxette. Source: Billboard. Roxette has earned a mention in Billboard's look at the milestones in the history of its Hot 100 countdown. The group's name comes in the same breath as the Beatles, Michael Jackson, and Madonna. "Listen to Your Heart," the 706th song to ever hit number one on the famed chart, was the first chart topper to be available only as a cassette single. All prior number ones had been available for purchase on vinyl. The nostalgic look back was prompted when Lady Gaga's "Born This Way" became the 1,000th number one in the chart's history. Written by tevensso on February 25, 2011 to Exclusive and Roxette. Source: DJ Mr. Gee. The latest news and discussions on the Swedish pop music group Roxette and its members Marie Fredriksson and Per Gessle. Get the latest articles to your mailbox, subscribe to The Daily Roxette newsletter.